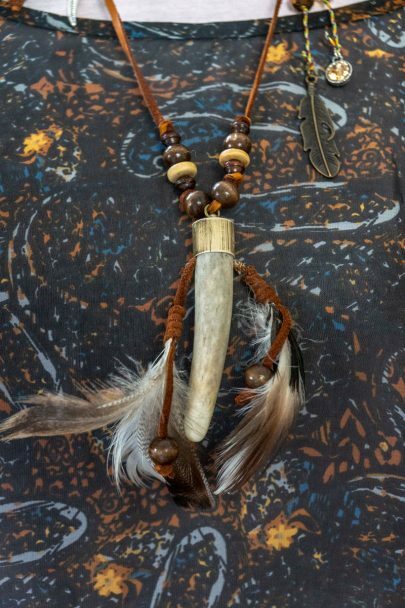 This Mystic Antler deer antler tip pendant features a 3-inch hand cut and polished deer antler tip securely attached on an adjustable (12 – 18 inches in-length) brown leather cord affixed with a brass cap. 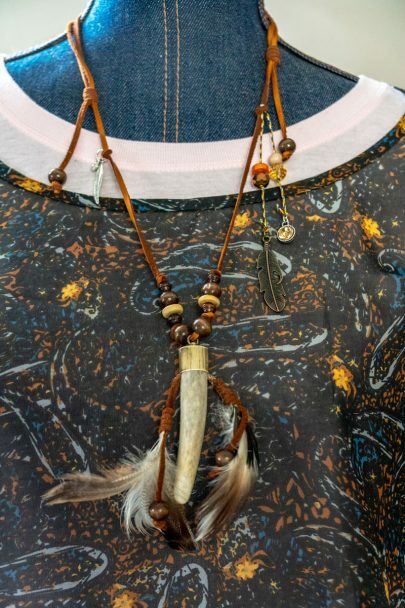 The antler necklace is embellished with two bundles of feathers, wood and plastic beads, two metal feather embellishments (1 is 1/2″ silver in color and the other is 1″ long and bronze in color), and two smaller faux gemstones embellishments for accenting. The necklace is fully adjustable in size. Adjustable to a full 12 – 18 inches in-length. Comfortably fits most neck sizes. Secured with an antique finished brass fitting on antler tip. Embellished with 2 metal feather charms, one 1/2″ long silver in color metal feather and one 1″ long bronze colored metal feather, earth-toned colored feathers, plastic and wooden beads,charm and several faux gemstones.